The 1837 Ioway map reflects extensive native historical and geographic knowledge which until the arrival of Europeans was transmitted in ways other than in writing. Applying Geographic Information Systems (GIS) to this map helps modern viewers understand the map's meaning and importance. Archaeologist Mary Whelan used computer technology to correlate the Ioway map features with those on modern maps in order to help pinpoint the locations of many of the villages and travel routes. 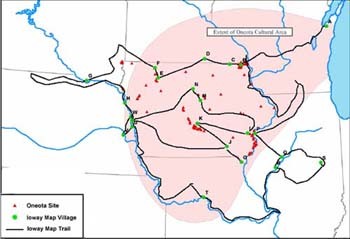 Some mapped settlements correspond to protohistoric Oneota archaeological site locations. Also, a village shown on the Des Moines River in modern Van Buren County is almost certainly the Iowaville site, are currently known, GIS offers valuable information to plan future archaeological research in those areas. GIS and historical records suggest that the Ioways depicted features on their map for reasons other than geographical accuracy. For this reason the map provides a window into a native symbolic system. Distances in time as well as space, and possibly social distinctions, may be symbolized in the positioning and size of map features. 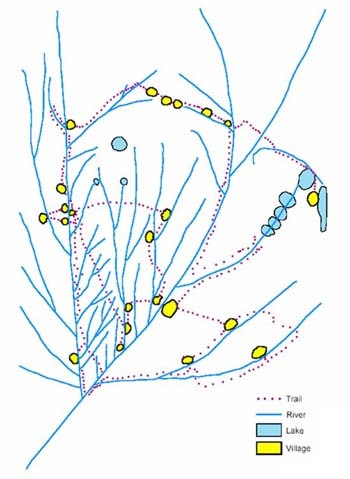 Perhaps villages that were actually far from one another were drawn more closely spaced because of the close relationship of social groups in those villages, or perhaps because they represent settlements occupied at the same time. Time differences are also suggested by overlapping symbols, the younger event being displayed on top of the older. The line order and weight may have meaning. The size and number of enclosed dots marking villages may convey the relative size of settlements. 2003 The 1837 Ioway Indian Map Project: Using Geographic Information Systems to Integrate History, Archaeology and Landscape. M.A. Thesis, University of Redlands, Redlands, CA. 2000 Description of the 1837 Ioway Map. In An Atlas of Early Maps of the American Midwest, Part II, edited by W. Raymond Wood, pp. 14-17. Scientific Papers, Illinois State Museum, Springfield.